Posted by Bravado Cooking for Men in Classic Appetizers, Classic French Dishes, Recipes. Bravado Cooking is about cooking with flair and élan – converting the preparation of a dish into a “food event” that your guests will remember. Sass and swagger are words we like. Bravado Cooking is also about making things from scratch – like piecrust, pizza crust, wine vinegars, mayonnaise, yogurt and breads. We’re also into making classic dishes. Bravado chefs don’t clip cute recipes out of magazines before they have perfected some of the great recipes of the past. There is nothing more classic than the French and we’ve been doing a mini-series on French cooking. We recently announced our choice of “Mastering the Art of French Cooking” by Julia Child, Louisette Bertholle and Simone Beck, as one of the top three cookbooks of all time (Best Cookbooks). We told you about the “Julia Child Night” that we did for a charity event. We’ve had a couple of posts about the Tarte Tatin, which we served for dessert that night. 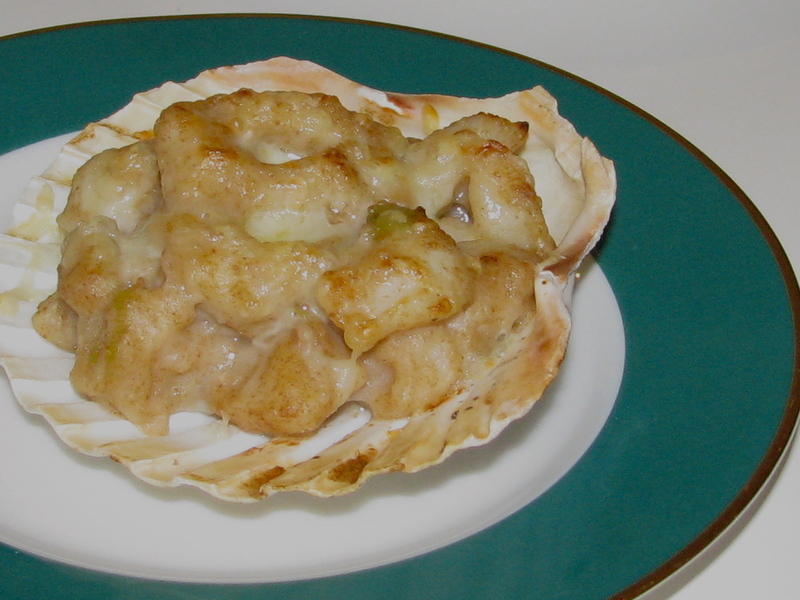 We served another great favorite as the appetizer that night – Coquilles St. Jacques (pronounced “ko-kee san zhak”). This literally translates into St. James Scallops. The basic recipe is found on page 218 of Julia’s book, which you should buy if you haven’t already. 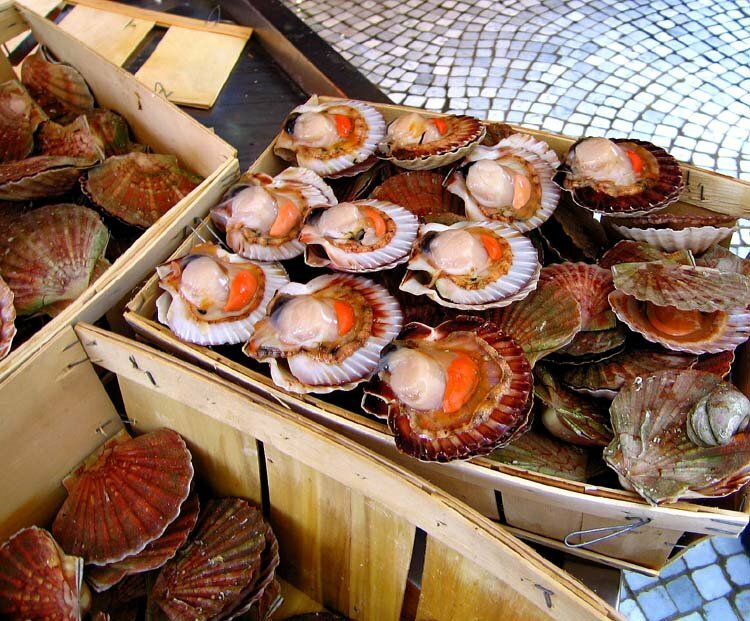 There are literally thousands of recipes for Coquilles St. Jacques – it is a French classic and everyone wants their own imprimatur. Julia’s recipe is very simple and we have changed it very little – a bit more cheese, garlic and onion and some clarification on ingredients – we like to use Bay scallops (since it is difficult to get the true St. Jacques scallop in the U.S.) and vermouth instead of white wine. This dish needs to go under the broiler before serving. 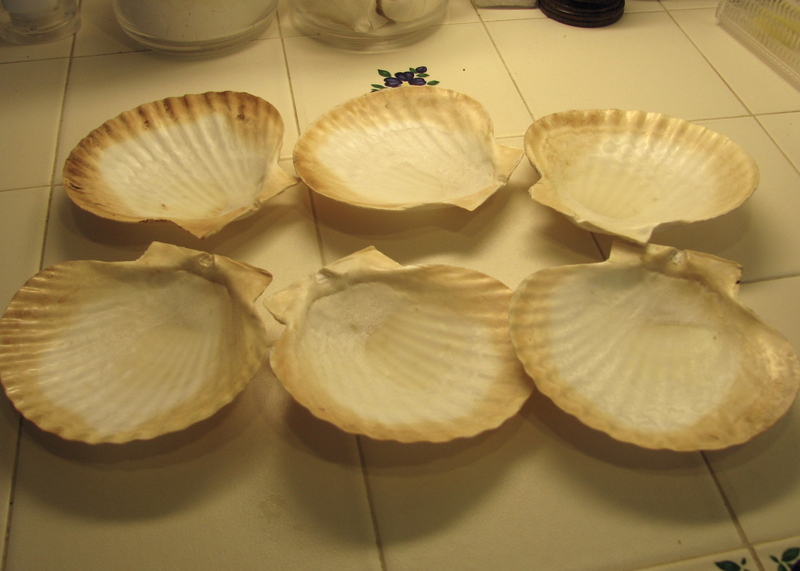 Some people use ramekins, but it is much sexier to get real scallop shells, which you can generally find – call Nautical But Nice in Florida (561-747-8991) and they will be able to help – they cost about $2.00 apiece. As you can see in the photo, they take on a nice patina after being used. Wash the scallops with water and dry well with paper towel. In a large sauté pan, cook the onions in one tbsp. of butter for about five minutes over medium high heat. Add the garlic and shallots and cook for another two minutes. Remove the cooked ingredients with a slotted spoon and set aside in a small bowl. Heat 2 tbsp. of butter and the olive oil over high heat in the same sauté pan. Shake off the excess flour and brown the scallops for two-three minutes on each side. You want the outside to be a crispy brown. Make sure the heat is high enough to accomplish this. Take the scallops out and set aside in a bowl. Add back the cooked onions, shallots and garlic along with the bay leaf and thyme. Stir well. Add the vermouth and water and deglaze the pan with a spatula. Turn the heat to a strong simmer. Cook uncovered for about five minutes and no more. The sauce should have reduced to about one-half and thickened nicely. If not, turn the heat up and continue for one more minute. Turn the heat to low, add the scallops and stir well. Add salt and pepper to taste. Spoon the sauce and scallops into the shells. Top each shell with a pinch of grated cheese and a small pad of butter. Put the shells on a baking sheet and place under the broiler for one minute until the cheese starts to brown. If you want to serve later, cover with plastic wrap and refrigerate. You can keep in the refrigerator for 24 hours without problem. Just before serving, put under the broiler for 3-4 minutes until top is lightly browned. Using tongs, transfer the shells to a small charger plate, let cool for a couple of minutes and serve. Next week we’ll do Beef Bourguignon and, combined with the Coquilles St. Jacques and the Tarte Tatin, you will have everything you need to do a classic French dinner. Here is a great variation on this dish. We wanted an easy late night supper. So, we made some rice. We then prepared the Coquilles St. Jacques per the recipe, put a nice mound of rice on each plate and poured the luscious sauce over the top. We added the grated Gruyere y voilà. I accidentally added too much dry vermouth, but it quickly bubbled away and gave a great flavor.